European security and defence policy, once propelled by Franco-British cooperation, has been held back of late by Nato enthusiasts. Without the UK, can the Commission advance a new Defence Action Plan? Book review. 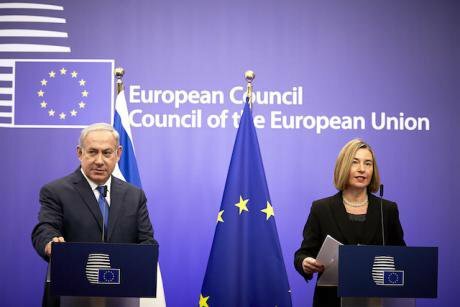 Israeli Prime Minister Benjamin Netanyahu and the EU foreign policy chief Federica Mogherini are at the EU foreign ministers' meeting in Brussels on December 11, 2017. EU/Press Association. All rights reserved.During the referendum on British membership of the European Union, one of the many charges against the European Union put forward by the leave campaign was fear of a European army. There has also been talk of an emerging European ‘security-industrial complex’ as a range of surveillance systems are introduced as part of EU counter-terror measures and as defence research and defence co-operation are stepped up (see Chris Jones, oD, 31 August 2017). But the situation is much more complex and contradictory than these negative depictions suggest. It is important that those of us who still believe in ‘normative Europe’ – the idea of the European Union as a peace and human rights project – understand these contradictions and the possibilities they open up for a more transformational agenda. Nathalie Tocci’s book is a useful corrective to the more pessimistic portrayals of current developments within the European Union. Tocci is Director of the Italian Institute for International Affairs and advisor to Federica Mogherini, the High Representative for Common Foreign and Security Policy and Vice President of the European Commission. She was tasked with drafting two documents – an initial statement of the strategic context facing the EU, presented to the European Council in June 2015, entitled The European Union in a Changing Global Environment: A More Connected, Contested and Complex World, which paved the way for a European strategy document, presented to the European Council the day after the Brexit vote, entitled Shared Vision, Common Action: A Stronger Europe. A Global Strategy for the European Union’s Foreign and Security Policy’ (EUGS). The book, ‘Framing the EU Global Strategy’, offers a fascinating insight into how these collective documents are produced, even though both documents are unusual in that they involved greater public consultation than normally happens, while at the same time – probably owing to the deft steerage of both Mogherini and Tocci – they manage to be coherent and readable. It provides a guide to reading the global strategy and an explanation of some of the concepts developed in the strategy document, and also gives some indication of what has happened since in terms of implementation. The book starts off by contrasting the process it has undergone to that of the European Security Strategy (ESS) produced when Javier Solana was High Representative, entitled ‘A Secure Europe in a Better World’ and approved by the European Council in December 2003. First of all, the EUGS is a global strategy not a security strategy even though, of course, it includes security. It is global not only in the sense of encompassing EU relations with the whole world but also in the sense of bringing together a whole range of instruments. Mogherini, like Cathy Ashton before her, is double hatted. She represents both the European Council, composed of member states where the main instruments are defence and diplomacy, and the European Commission, where the instruments are much broader including aid, development policy, conditionality, dialogue, humanitarian assistance, support for civil society, research and education, transport and so on – that is, all the necessary twenty-first century components of a global strategy. Secondly, the ESS is a strategic vision rather than an actionable policy document. The policy options were much easier for Solana in the early 2000s so he was keen to get agreement on the overall direction of ESDP rather than specific policies, which might have diluted and complicated the document. The global strategy as can be seen from its website has become a policy framework for Mogherini and her team. Thirdly, and most importantly, the international context has utterly changed. The ESS was drafted in a mood of optimism about the international liberal order despite the US invasion of Iraq earlier that year. Indeed it was a European response to the invasion – an attempt to overcome the cleavage created by the support of some countries for the invasion (most notably the UK and Spain). It represented a contrast to the US National Security Strategy published that year, which made the case for pre-emptive defence (the illegal grounds on which the invasion was justified) and counter-proliferation as a new militaristic approach to the spread of nuclear weapons; the ESS counterposed ‘preventive engagement’. The most successful example of that was the negotiations with Iran initiated by Solana but completed under Cathy Ashton. The situation facing the EU in 2015 as Mogherini assumed her dual EU role, was very different and about to get worse. There were internal cleavages over the euro, over refugees and migrants and over the aggressive role of Russia; and far from moving towards a liberal international order, the EU faces worsening violence and disorder in its southern neighbourhood, especially Syria, Libya, Mali, Somalia, DRC, S. Sudan, Yemen and more; growing reversals of democratic achievements especially in Turkey and Egypt; not to mention, growing geopolitical rivalries as well as poverty and deprivation, climate change, and transnational crime. Principles include engagement, responsibility, unity and partnership. Priorities include security; the resilience of states and societies in the East and South; an integrated approach to conflicts and crises; cooperative regional orders; and global governance for the twenty-first century. The last part of the EUGS contains concrete proposals for a more credible, responsive and joined-up union. In terms of implementation, it is the defence and security part and the conflict and crises part that has, in the jargon, been actioned. In the case of defence and security, this is where the critics get nervous. The reason for the prioritisation of security is partly public opinion. Eurobarometer figures show that public support for European security is greater than any other area even in the UK. But another reason is Brexit. Although the European Security and Defence Policy (ESDP) was originally propelled forward by Franco-British cooperation in the Blair years, Conservative governments have acted as a brake on European security co-operation, since they favour NATO. Now without the UK, the Commission has been able to produce a European Defence Action Plan and is providing financial incentives for developing joint defence capabilities (funding would be exempt from the Stability and Growth pact, e.g. austerity constraints) and is supporting defence research projects. But what is proposed for European defence is very different from classic national and Nato defence and this has to be understood. National and Nato defence are about defending borders from geo-political threats; they are about planning for the next war. European defence, EUGS argues, is about external crisis response – peace-keeping for example, building the security and defence capabilities of partners, and about the protection of the Union and its citizens. This last is about citizens rather than territory. It is about the cross-over between internal and external security, and about new issues like cyber security, or terrorism or the protection of critical infrastructure. It is more about policing and intelligence than tanks and aircraft. In other words European defence and security policy does not consist of a European army. It involves a different combination of capabilities designed for situations other than classic inter-state war. It is an expression of the EU as a new kind of polity, not a super-state in the making but a regional organisation aimed at preserving the advantages of trans-European society by extending those advantages outwards. Of course there are some inconsistent elements in the EUGS, and Tocci duly explains how difficult it was to escape from certain facets of geographical reasoning. And of course, Mogherini faces huge obstacles. Many member states are moving in opposite directions, building walls and fences and dismantling the machinery of rights. The traditional defence industries are keen to get in on the act and may impose their own trajectories on defence co-operation. Meanwhile, the whole European response to migrants has constructed a self-reproducing border industry, with counter-terror imperatives leading to terrifying degrees of surveillance. However, it must be pointed out that EU cyber security policy emphasises human rights and privacy in contrast to national policies ( see Genevieve Schmeder and Emmanuel Darmois, oD). But a reading of Tocci’s book demonstrates the earnest commitment of the collective effort involved in the EUGS to lay out a new kind of twenty-first century approach to peace and security. One final comment. The EUGS was steered through by two powerful women. I am left with the question of what role gender played, not only in the personal resistance they must have faced, but in the elaboration of a more inclusive, less muscular, and, as Mogherini points out in her foreword, more ‘incisive’, conception of security. Nathalie Tocci's Framing the EU Global Strategy: A Stronger Europe in a Fragile World is published by Palgrave Studies in European Union Politics, Palgrave, Macmillan, 2017.